Swann Auction Galleries remains the only major auction house with an entire department dedicated to the consignment of works by African-American artists. In the October 5 sale of African-American Fine Art, there are numerous praiseworthy lots available. Of particular interest though, is a painting by one of the most popular African-American artists of the nineteenth century; the Pittsburgh-born Henry Ossawa Tanner. 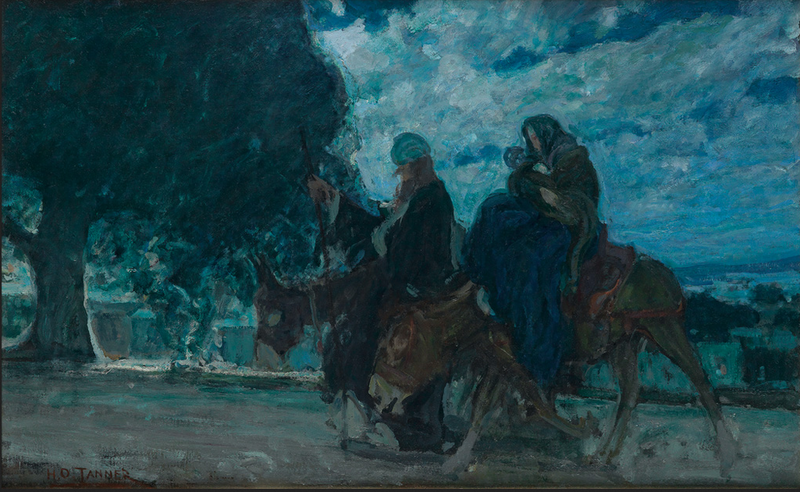 The fourth lot in the October sale is from Tanner's series of paintings that focused on the biblical story of the Holy Family's flight into Egypt. The most well-known work using this motif is in the collection of the Metropolitan Museum of Art in New York. In the Met's picture, Joseph, Mary, and the infant Christ are shepherded into the gates of a city under the cover of night. Mary swaddles her newborn son while riding a donkey, the whole scene foreshadowing Christ's entry into Jerusalem in adulthood. The lamp of a faceless attendant lights the path and an architectural background likely inspired by Tanner's travels in North Africa and Palestine. The work is executed in Tanner's painterly style, a later improvisational mode in his technique which blossomed in the early years of the Jazz Age. The rich milky blues in the painting at the Met match tones seen throughout Tanner's work in this period. In the painting that will be auctioned by Swann, Tanner returns to the same story. The Holy Family is pictured in a tight grouping with two donkeys, a town low in the distance and a hazy moon hidden by clouds overhead. This nocturne bears the hallmarks of Tanner's style after the turn of the century, with the same cool blues seen in the Met's painting and throughout his oeuvre. It is a fine example of Tanner's mature work. With that latter-day Impressionist handling of the brush, it could as easily have been painted the artist's contemporaries Sargent or Sorolla. Completed between 1920-1925 it was made at the same time as the Met's version and at the height of Tanner's public fame. He was awarded the rank of Chevalier of the Légion d'honneur by the French Government in 1923. This painting is a bit murkier than its well-known counterpart, but conveys the tense foreboding and drama of a quintessential biblical scene rendered by an artist with a passion for religious subject matter. Signed in oil, lower left. Tanner was born just two years before the start of America's Civil War to Benjamin Tucker Tanner, a Bishop of the African Methodist Episcopal Church and Sarah Tanner, a mixed race woman who had escaped the slavery into which she had been born through the Underground Railroad. His family prized education and independence, and ran in intellectual circles. This included a close friendship between the artist's father and Frederick Douglass. In 1879, Tanner was admitted to the Pennsylvania Academy of Fine Arts. The only black student in the Academy, then the preeminent art school in the United States, Tanner was able to study directly under Thomas Eakins. Eakins, the master of American realism, would have inspired Tanner with his commitment to new fashions of studio practice, enabling the young artist to explore painting without the burdensome and outmoded practices of more rigid instructors. Though Tanner is regarded as the first African-American artist to gain international acclaim, he lived most of his life after 1891 as an ex-patriot in France due to widespread racism in his home country. In 1899 he married the white opera singer Jessie Olssen and they had one child together. Such a union would remain illegal in the United States until 1967. The more liberal French culture of his time lead to success and comfort for Tanner. In an interview regarding the 2012 exhibition Henry Ossawa Tanner: Modern Spirit, curator Anna Marley, PhD, notes that in the United States Tanner was regarded as a "Black artist", while in France he was simply know as Monsieur Tanner, artiste Americain. Tanner's frequent explorations of biblical stories throughout his career underscore his religious upbringing in an erudite Christian home. But his repeated return to the imagery of the Holy Family fleeing King Herod bears a more significant symbolic weight. The images of pilgrimage for safety and freedom pictured in his scenes of Joseph, Mary and the Christ-child are natural metaphors for the journeys of escaped slaves like his own mother. In using accepted canonical imagery in the genre of religious painting, Tanner avoided being pigeonholed as a "Black artist" while subtlety exploring themes of great relevance to the Black experience. The Civil War was a notoriously religious affair, with both sides claiming God's solidarity with their cause. In the aftermath of the War and in light of the newly held but tenuous rights of African-Americans in the late nineteenth and early twentieth centuries, Tanner utilized American religiosity as a means to deliver a message about family, freedom, and love that was powerful for African-Americans who continued to work to see their rights properly recognized. With an estimated sale price of $200,000-$300,000, it is probable that the painting on offer at Swann in October will be bought by an institution. It will be interesting to see the amount of activity this work generates in the marketplace and if, in the end, it goes into another private collection or if Flight into Egypt becomes available for the public in a museum setting. The potency of Tanner's personal story and artistic accomplishments makes his work particularly prized in any situation, but in the current political and social climate a painting of such quality by a groundbreaking African-American painter may be even more sought after.